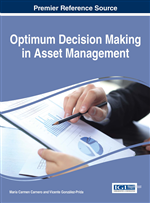 This chapter book will analyze different systems of indicators by which maintenance management is evaluated. The models analyzed are: 1) The Balanced Scorecard. 2) The Alsyouf Model. 3) The Maintenance Scorecard Model. 4) The Metrics for Maintenance of SMRP (Society of Maintenance and Reliability Professionals). 5) The EN-15341-Maintenance Key Performance Indicators (European Standard). This paper presents a model for indicators based on various hierarchical levels and different functions and processes taking place in a maintenance department. With this model a comprehensive assessment of the most important aspects at all levels of the organization is achieved and shows the relationship between the various indicators to understand the overall performance of maintenance management and so align departmental objectives with the strategic objectives. Also is developed the C-KPI-M model, which is the definition of 18 chains of key indicators for viewing the cause and effect of the maintenance KPI that contribute to achieving the maximum Economic Value Added (EVA). To measure the performance of maintenance management, a set of indicators to measure different aspects of the management process is used, the most common reflect the performance of the equipment and the costs of maintenance. These two types of indicators are clearly lagging indicators and indicate the status after the action has taken place. For this reason, you should design a system of indicators that includes preventive actions to avoid undesirable results. Indicators should be formulated for the different levels of the organizational structure and for each level, indicators have specific purposes for specific users. Users at the highest management level relate to the overall administrative performance, while those in the functional levels are related to the physical condition of the assets. The use of multiple indicators of performance levels of systems and subsystems helps solve problems. If a corporate indicator shows a problem, then lower level indicators should define and clarify the cause of the weakness that has caused this problem. The relationship of the indicators at different hierarchical levels with business goals is vital to the success of a program of physical asset management. It is shown below the basics of five models of systems management indicators that are widely used to measure the performance of maintenance management and constitute the conceptual basis of the model presented here.